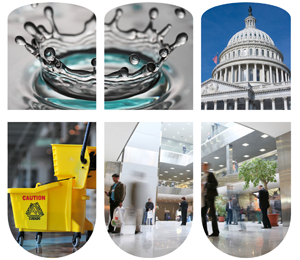 RMC offers sustainable total cleaning and facility maintenance solutions for government facilities. Many of our cleaning and water treatment products are offered under GSA contract, and we also offer several Skilcraft branded, biobased green cleaning products under the Abilities One Program. Our certified green housekeeping programs include 3rd party certified products, and detailed training and support materials to help improve indoor air quality, as well as the health of your workers and building occupants. We also offer support in pursuing LEED certification for your buildings. Our wide variety of floor care programs give you the opportunity to improve your productivity, and offer low, high, or flexible maintenance options. Maintaining clean restrooms is critical to keeping your building occupants happy. Our restroom products help you achieve customer satisfaction with odor control, hand care, green cleaning, and disinfecting programs. RMC's comprehensive water management will also save water and energy dollars. Our programs are designed to meet the needs of your facility, promoting guest/tenant satisfaction, worker satisfaction and productivity. High quality water is a critical factor to your HVAC systems. As your water management consultant, RMC will evaluate your system efficiency and design a program that will attain optimum peak operating efficiency. Our trained staff will work with your personnel to implement joint process improvements that will lower your operating costs. Click below to learn more about our programs designed for government facilities.